Perhaps a better name for this technique would be “inspiration”. In this technique the motive or phrase is repeated in an altered form. Those alterations may be based upon melody, harmony, rhythm or any combination of any one, two or three of these. In a variation the intervals, rhythm and chords are changed from how these were established in the original motive or phrase. Two ways are available to create harmonic variation. A pattern of chord changes can be imposed upon a melody. Or, a melody can be sequenced and a new pattern of chords can be selected to be consonant with the melodic changes. 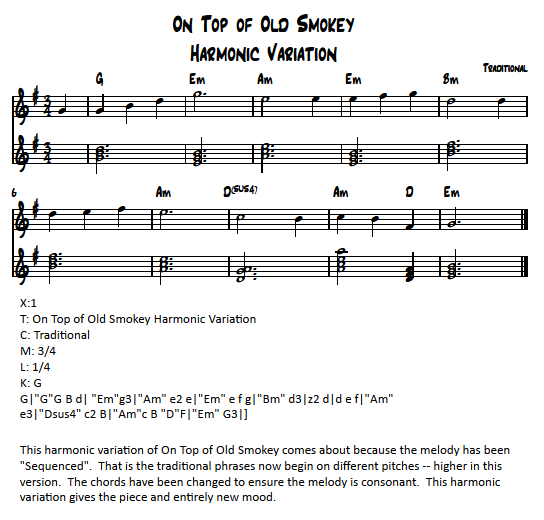 Here is a harmonic variation of On Top of Old Smokey. This is certainly NOT the only possible harmonic variation available. It may not be the best possible harmonic variation that could be created. This harmonic variation was created by sequencing some of the phrases and then selecting chords that are consonant with the new melody. This variation changes the song from a camp fire favorite into a sad ballad.